We can also handle spiral (continuous coil), comb, spiral and wire binding, Products: Books, Brochures, catalogs, Magazines, booklets, School text books, reports and Annual Reports. We are proud to say that we are counted among the top Binding Machines Suppliers located in India. We provide a vast range of binding machines that includes book binding machines, paper binding machine etc. Our binder machines are manufactured using the best raw material along with the most modern technology. We offer a wide gamut of Wire Binding engineered from fine quality steel and wire at our vendors end. 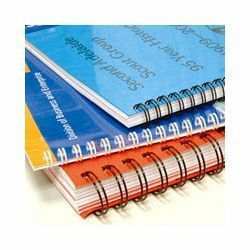 Our offered wire binding is designed by expert professionals at the sophisticated manufacturing unit of vendors while keeping in mind the international standards.